Bernard Pius is well represented carver in different galleries in Dar es Salaam and he created his own personal style. He was born in Mtwara (south Tanzania) in 1966 and it was there where he learned from his father Pius Ndiyii to carve. When he came to Dar es Salaam in 1990 he continued to learn from Mr. Matambe. 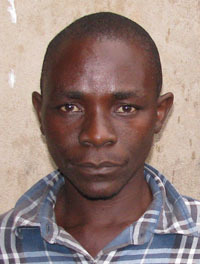 Now he lives in Dar es Salaam with his wife and 4 children - Bernard, Susanna, Neema and Zacharia. You can see Bernard and Susanna in our gallery.